The festivities of revelry are never as outgoing and widespread quite like what happens throughout the world before the Lenten season, whether or not one chooses to participate. Trying to say goodbye to excess and habits by indulging in them seems rather odd to me, but nevertheless I like an opportunity to wear some great colors. The trademark tones for the popular American “Carne Vale” are as bold in their pairing as the party antics which are carried on. They are as rich in history as they are saturated in hue. Yellow gold, dark yet bright purple, and a cheery grass green are quintessentially, visually recognizable of a New Orleans inspired pre-Lent celebration. 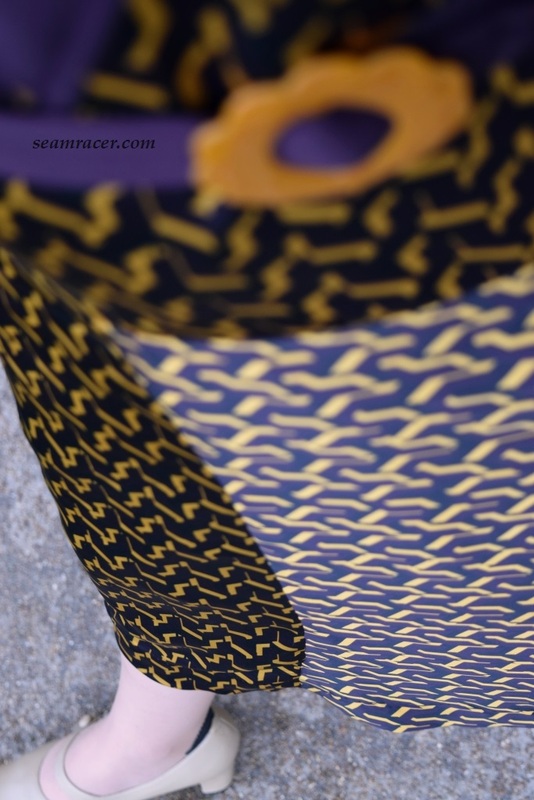 Not that this post’s outfit was originally intended to call to mind Mardi Gras…it was just an Art Deco fabric on hand and the inspiration of the 1930s penchant for bold color pairings which led me to make the dress you see. 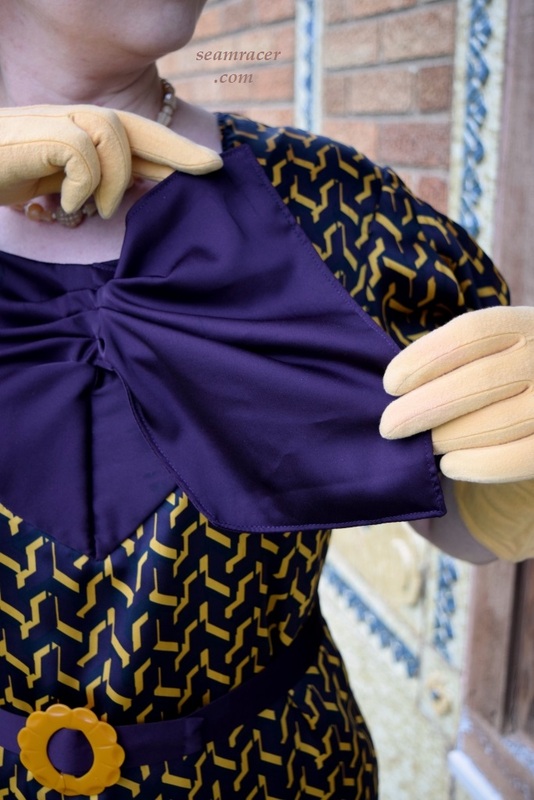 This had been one of my early 1930s projects I had intended to make back when I started blogging, but I realized both that I was not ready for the challenge and I was perpetually undecided on a fabric choice. Finally, everything came together and I am so happy with the results! 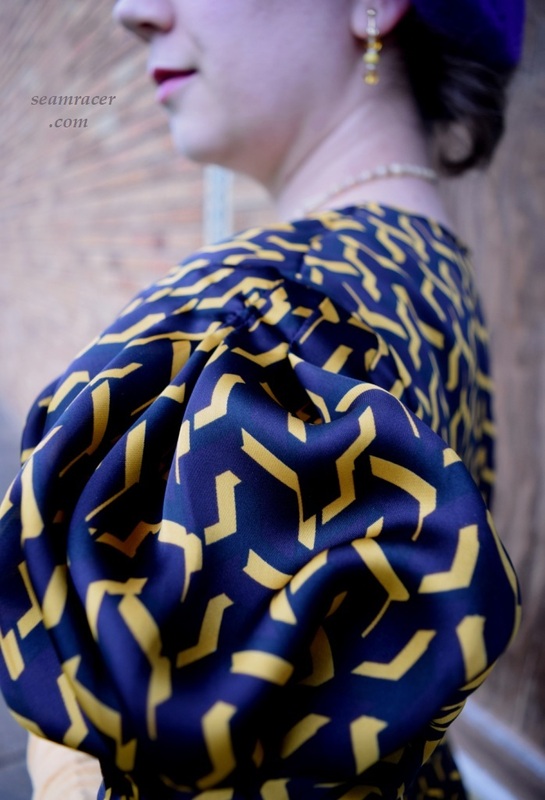 The geometric print is perfect for a dress from the very early 30’s, the fabric appears much nicer in quality than a modern poly, and the design has such great features I think it is so appealing even for today. To keep with both the Mardi Gras theme and the 30’s inspiration, I am wearing a modern wool beret. Mardi Gras is a French word after all, and New Orleans has a rich French heritage, so my beret fits right in! Do you notice the fancy stylized French Fleur-de-lis on the wall behind me, as well? Also, look for my special accessories, too. 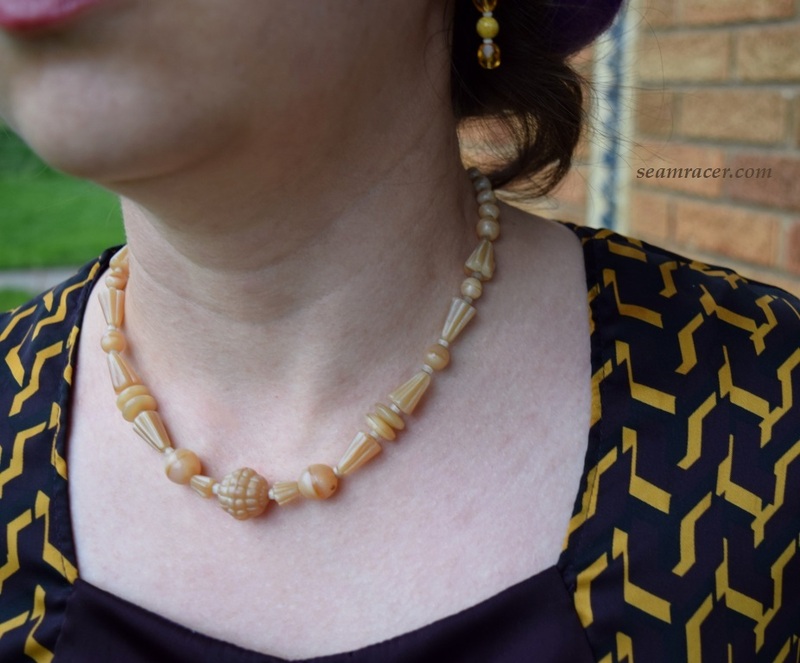 The necklace is a true vintage gem – a 1920’s glass bead piece that needed my help by doing a restringing and adding a clasp for a whole new life. My earrings are me-made to match (as best I could) using clip-on blanks. My gloves are true vintage from the 30’s. I even broke out my old timey Cuban-heeled stockings! NOTIONS: The belt buckle is a prized Bakelite vintage item I’ve been holding onto for the perfect project like this! (Subsequently, the buckle has sadly broken…and is tentatively glued back together for now.) All else that I needed was lots of thread and some scraps of interfacing for the sleeve bands and belt. 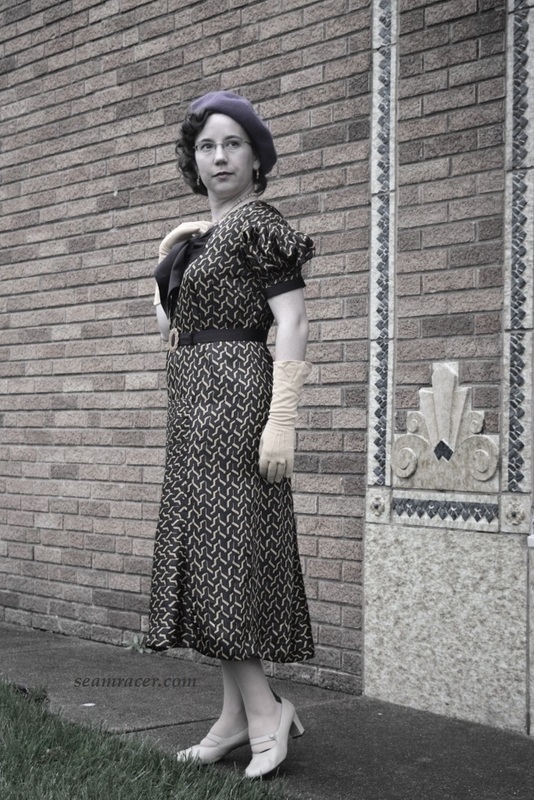 It’s a simple needs Depression-era garment! TOTAL COST: The fabrics for this dress are more of my precious hoard of clearance deals which I bought when Hancock Fabrics was going out of business. I don’t remember exactly but this dress can’t have cost me more than $15. 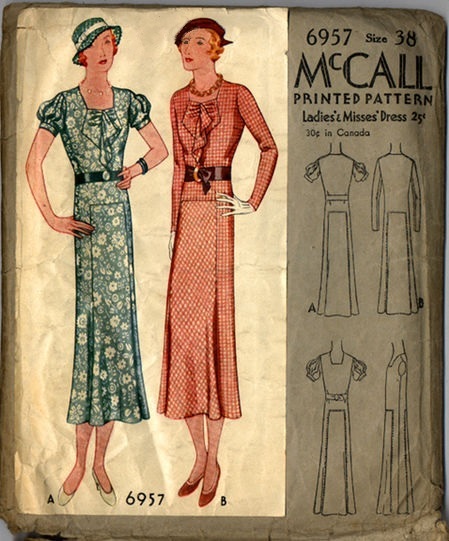 Now, I recognize that the Eva Dress Reproduction Pattern Company also sells copies of this McCall pattern, but I have always preferred Past Patterns. Besides – their sizing is closer to mine which means less dramatic grading for me. 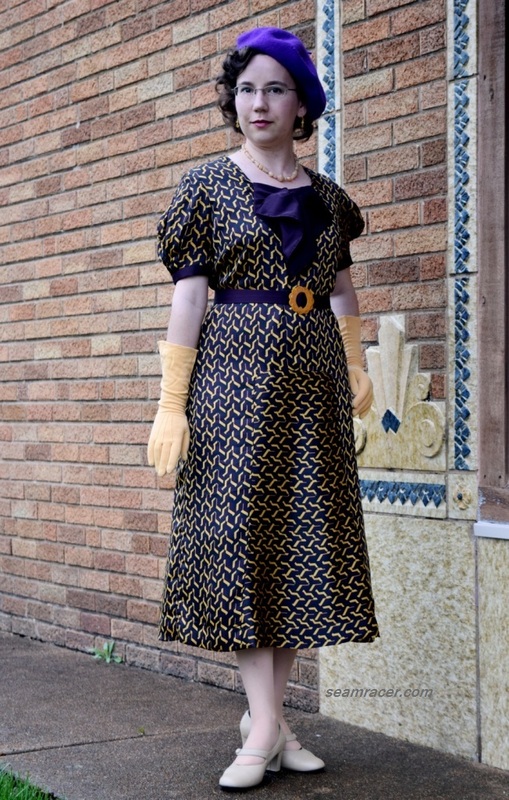 However, if you need a bigger size than Past Patterns’ 36” bust, Eva Dress’ repro is a 38” bust. Even still, I often find 1930’s patterns from 1936 and before seem to run small and this one was no exception. You want a slightly baggy fit with this dress because it is a slip-on with no side zipper called for. Also this design was coming from a time that was still easing away from the 1920s, which is very obvious when I take off my belt! I graded this pattern down to what was still technically a roomy size for me (with extra for a modern 5/8 inch seam allowance) and I feel it fits perfectly enough to both be comfy and land at the right points on my body. I am quite impressed with this pattern. Everything matched together well and it turned out just as the cover drawing portrays. It was relatively easy to figure out how to sew together despite the fact that there are several tricky spots to take time on. Many of my other 30s patterns made to date needed tweaking to the fit, or some of the panels were a bit off, or some of the instructions lacking…but not with Past Patterns. The designs they choose to reprint have so far always turned out happily successful for me so far. Making the many exact points and precise corners to this dress was quite time consuming and honestly a bit stressful along the way. My fabric was a very slippery and always shifting material. It was hard to be precise and avoid any bubbling out at the points, especially since (for the skirt insets) I was trying to connect two opposing grain lines together. The insets were stitched together like a regular seam, making it harder, but the neckline contrast was invisibly top-stitched on to be exact and clean because it is more easily seen. All of the pattern pieces were rather odd and almost unrecognizable on paper, but looking at the cover they all made sense. It’s amazing how sewing works, isn’t it?! The front is all one enormously long piece (as there is no waist seam) which appears like a giant capitol H, because of the insert panels at the neck and skirt center. The back is mostly like a squared-off basic bodice, except with two ‘tails’ attached for either side of the middle panel. The seemingly rectangular middle panels swerve out on the sides like the curve of half of the letter U to provide soft fullness to the skirt below knee. The sleeves, dramatically opened up because of the numerous pleats, are almost 30” wide. 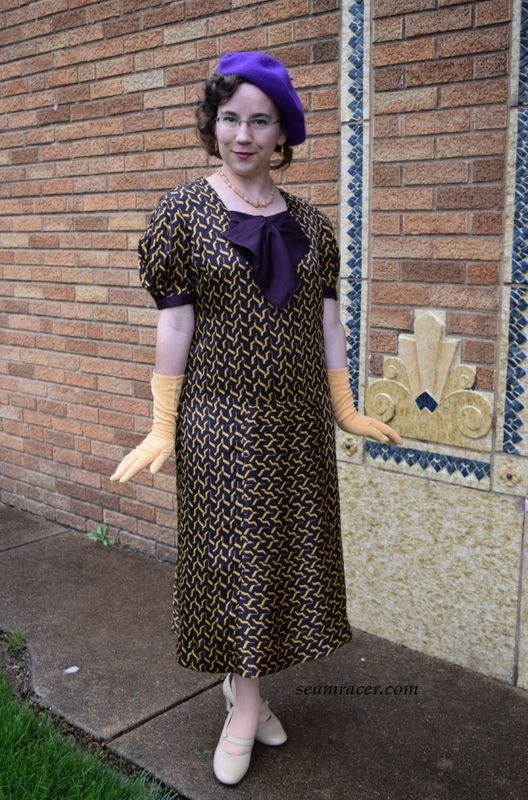 It’s no wonder that this dress needed a very anti-Depression era fabric amount of 3 ½ yards…and I was using 60” width material! I have never done tucks quite like what was called for on these fun, poufy sleeves, and it was sure an experience. You have to make them in a certain direction because they are layered on top of one another. I have seen this type of mock-pleating on the skirt waist some couture garments (such as Dior). You start from the side and pleat towards the center then move to do the same for the other side. Both top and bottom have to be done separately because the center has to be left free. All the pleats are folded into the skinny cuff band and attached to the dress…suddenly the sleeve looks amazing! I had planned on an organza ‘filler’ to go inside the sleeve thinking it would need help poufing out, but no it doesn’t, even though my fabric is silky soft. My printed fabric and the discrepancy of photography does not do these sleeves due justice for their awesome detail. The neckline was definitely the most ingenious and usual piece of all, and I absolutely love the look of it in the contrast solid! It reminds of an adapted jabot, but it is merely called “a vestee” according to the pattern. 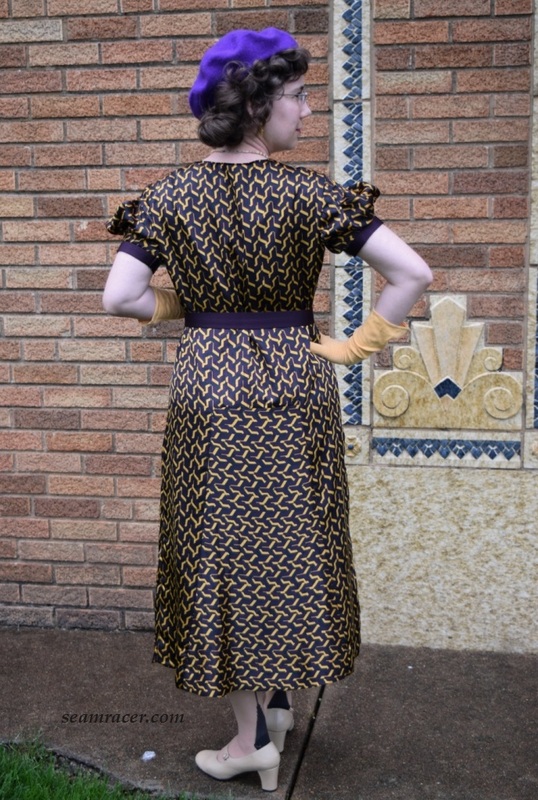 A project I’ve already made from the next year in history, my 1933 McCall’s reprint set, also has a wrapped front drape at the neckline – a more dramatic and simplistic version of what is on this ’32 dress. Neckline interest was very popular in the early to mid-30’s and I like all the interesting variety of it, especially neck drapes and ties. I changed up the instructed making of the “vestee” for what I think is a cleaner and more straightforward construction. It called for a single layer of fabric drape which connects to another single layer half piece which doesn’t have a drape. This would have showed the underside of the fabric, been awkward to sew together at the center, besides showing the hemmed edge. I made two, draped, full “vestee” style neck insets so that they could be sewn together like a facing for a clean edge along the center drape that doesn’t show the other color of the other side to the fabric. I had to add the trio of pleats to each of the two pieces before sewing them together and on the vest. Then I hand tacked the pleats together down the center. 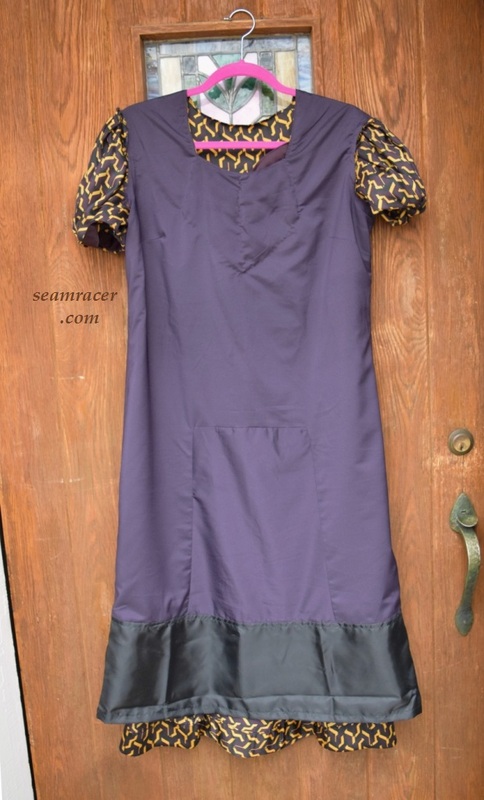 The same beautiful, rich purple solid satin as what was used for my 1951 slip dress and the details to my 1955 Redingote jacket went towards the contrast here to break up the busy print and made the most of my remnant stash. Just you wait, though, I am not yet done using this purple satin…there is one more project I’ve squeezed out of it (to be posted soon)! I used the darker satin side of the fabric on this dress. Purple normally is the color for royalty, and many Mardi Gras celebrations to have a King (and Queen) that is crowned to preside, but the southern American symbolism for it during the pre-Lent partying is “Justice”. The green represents “Faith”, gold represents “Power”. It all relates to both heraldry symbolism as well as the fact both United States and French flags are tri-colored. My green is the new spring grass, and the rest of the colors I’m wearing. I don’t always wear the dress accessorized like this – tans, or ivory, or black tones mellow out the bright but rich colors. 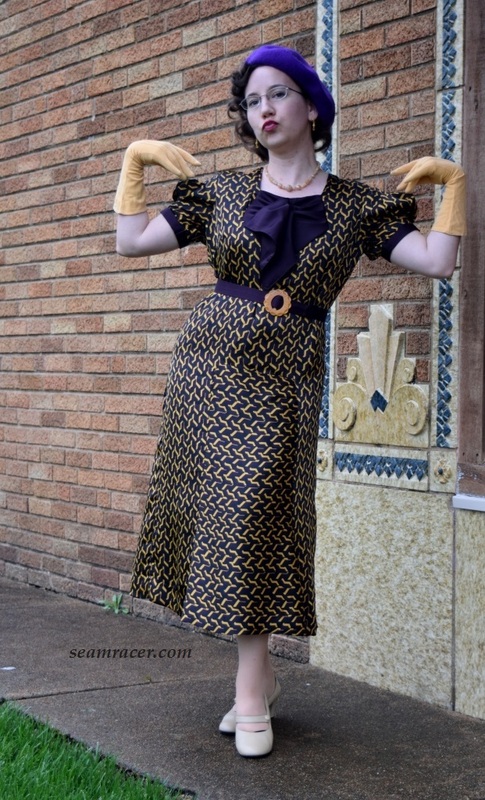 Finding vintage accessories in my size, in decent condition, in a reasonable cost, in more unusual colors is a challenge otherwise I would also try out pale yellows, or light purple, and other colors with this dress! My first sewing project from 1932 has been long in coming but I’m glad I can enjoy it now. I have been straying at the very strong shouldered and cultural influenced styles of the late 30’s for quite a while recently and this is such a refresher! This has me thinking about what will fill in my empty spot for the year 1930…hummm. Look for that this summer!